Mahatma Gandhi said, “The weak can never forgive. Forgiveness is the attribute of the strong”. How true is that! There are many benefits if we learn forgiving, well, sincere forgiving. We celebrate lot of festivals, can we celebrate forgiveness? “By begging forgiveness, happiness of mind is obtained and there is a kind disposition towards all kinds of living beings; by this kind disposition, one obtains purity of character and freedom from fear.” Lord Mahavira said this in Uttaradhyayana. Have you ever tried this? If yes, how did you feel? While one of ongoing fest is being celebrated, Paryushan, we thought it would be a good time to reflect and ponder about how forgiveness can be helpful to the person who gives it and also to the ones who receive it. We want you to introspect and write about incidents, stories where you felt liberated when forgiveness came in and what happened otherwise. 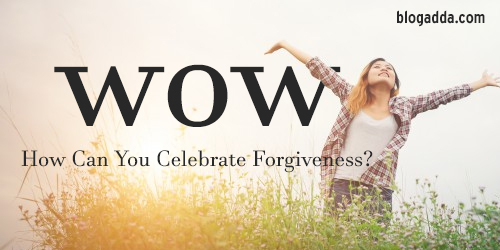 For this edition of WOW, write about ‘How do you celebrate forgiveness?‘. Write about all the things that led to it and the celebrations thereafter. Thank you. This post seems dated. We accept fresh posts as entries for WOW. Celebration of forgiveness is sweet in our Hindi movies.